Flight schedule may change without prior notice, every guest of Abode Asia Tours & Travels Inc.are requested to consult with your travel agents or nearest airline offices. Transavia flight are temporarily halted form 16th April to 7th October 2003 and the flight will be resumed once in a week by the name of Martin air from October 8, 2003. The schedule is yet not confirmed. Flight connection to Nepal : Nepal is linked with outside world by several international airlines. Countries in Pacific rim and west coast of America including Latin America are connected by major international airlines by flight that stops at Bangkok , Singapore and Hongkong. Airlines add and reschedule their flight or sometime discontinue their service due to the unforeseen conditions that continually develops. Singapore to Kathmandu Flight: Royal Nepal Airlines (RNAC), Thai International and Singapore Airlines provide suitable connection to Kathmandu. Singapore Airlines and Royal Nepal Airlines (RNAC) each has direct flights to and from Singapore. Bangkok to Kathmandu Flight: Thai International and Royal Nepal Airlines connect Kathmandu with daily schedule flights to and from Bangkok. 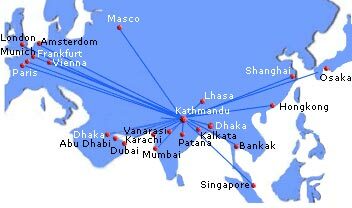 Hongkong to Kathmandu Flight: RNAC has three flights a week from Hongkong. London to Kathmandu Flight: is connected by RNAC, Qarter-Airways, and Pakistan Airlines (PIA). RNAC has direct flight from London to Kathmandu twice a week with stops at Frankfurt and Dubai. It has direct flight to and from Paris. Qarter Airways stops at Doha (Middle east); PIA has suitable connection from London and Zurich with stops at Karachi. For cost conscious Bangladesh Biman has 5 days a week schedule flights from Brussels and London to connect with Kathmandu via Dacca. Flight from Moscow to Kathmandu: Aeroflot (Russian airlines) flies once a week from Moscow to and from Kathmandu. Delhi to Kathmandu Flight: American cities in East - coast can get suitable connection to Delhi by using airlines that stops at London, Amsterdam or Frankfurt. There are daily several flights between Delhi and Kathmandu. India - RNAC and Indian Airlines has daily flight in between Delhi and Kathmandu . Bombay to Kathmandu: RNAC operates twice a week direct flight to and from Bombay. Flight originating in South Africa, Europe and Middle East uses these two cities to connect onward journey to Kathmandu; Other Indian cities that has direct flight connections with Kathmandu are Calcutta, Varanasi. Kathmandu- Paro- Kathmandu Flight: Other capitals that have air connections with Kathmandu are Paro (Bhutan), Druk Airlines (Bhutanese flag carrier) has twice a week fligh. Paro has direct flights to and from Bangkok.